Vito Adragna and his wife Lucy purchased their first property in Gilroy, California in the mid-1990s. 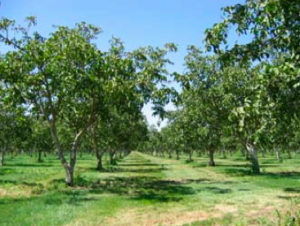 Shortly after they established that property, they acquired another plot nearby, on which they planted a 24-acre walnut grove, which is in organic production. Local organizations have helped them alter their production methods to save water and reduce costs by changing irrigation methods, planting cover crops, and continuously monitoring their soil moisture levels. When the Adragna family first bought their property, Vito used to move their gated irrigation pipes daily. Due to the constant reconfiguring of pipes they frequently leaked, and Vito was losing a lot of water. He says that the water leaking from the gated pipes was enough for his neighbor to grow willows next to the pump. Not only was this water wasted, but it was costly to Vito as well. After a friend suggested that the couple contact Natural Resources Conservation Service for assistance, Vito was able to implement new water conservation and cost saving practices on his farm. Switching an entire operation over to a new irrigation system is very costly. The low-flow sprinkler system that replaced the gated irrigation pipes cost $120,000 to install on twenty acres. With the help of NRCS, conservation cost-sharing and incentives programs covered ninety percent of the installation cost. Additional assistance came from the Santa Clara County Water District, which donated four soil moisture monitoring sensors. The help of these groups allowed the Adragna Farm to implement more efficient systems, which saved both water and costs. Vito and Lucy switched from gated irrigation pipes, which were time and labor intensive as well as less efficient, to low-flow buried pipe sprinklers that allow for a uniform distribution of water throughout the entire walnut grove. Included with the sprinkler system is an adjustable flow-rate so irrigation levels can be tailored to different soil types. With this new system, water loss associated with leaks has been reduced and irrigation is more efficient. The Adragna Farm also has an electrical resistance type monitoring system that determines the available moisture at root zones, so they can water more efficiently. This system has four field stations that have sensors at varying depths of the root zone. 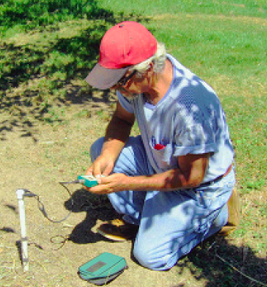 A handheld meter allows Vito to get a digital reading of moisture at each depth, which prevents over-watering. Adragna Farms now has a permanent drought-tolerant grass as a cover crop in the walnut orchard. Cover crops have multiple benefits, including, providing habitat for beneficial insects, retaining water, and reducing surface evaporation, run-off and soil erosion. Cover crops also improve air quality by reducing dust pollution caused during harvest and field operations. worked with organizations, including the California Institute for Rural Studies, to showcase the benefits of water conservation practices and the benefits of working with existing organizations, such as NRCS, that provide technical assistance and financing of new systems.